The New York Times‘ problem of misrepresenting the relationship between phones and traffic fatalities, which seems to have begun with Matt Richtel, has just gotten worse. Anyway, the new entrant is David Leohnardt. At the heavy risk of jeopardizing future opportunities to publish on the Times op-ed page, I tweeted that his recent column included “one of the dumbest things I’ve ever read in the NYTimes.” Washington Post WonkBlog writer Jeff Guo pointed out Leonardt’s column, which claimed that, with regard to the recent spike in traffic deaths, “The only plausible cause is the texting, calling, watching, and posting that people now do while operating a large piece of machinery.” The column contained not a piece of evidence to support that claim (though there were some awful anecdotes), which is why I said it was dumb. Which is too bad. But even though the spike in traffic deaths is concerning, reporting should not be wrong. Because it’s hard to add up the pluses and minuses in your head, It would be really easy — really really easy — to look at Leonhardt’s chart and think fatalities are higher now than they were in 1980. But rather than pointing out that fatalities per person have fallen by half since 1980, he instead writes, “It’s the first significant rise in a half century,” which would be true except for the significant rise in every single decade of the last half century. This is a lot like when Richtel described the 2015 rise as, “soaring at a rate not seen in 50 years.” Not that the rate was not seen in 50 years, of course, just that the soaring of the rate hadn’t been (or so the NYT Science Desk told me when I complained). 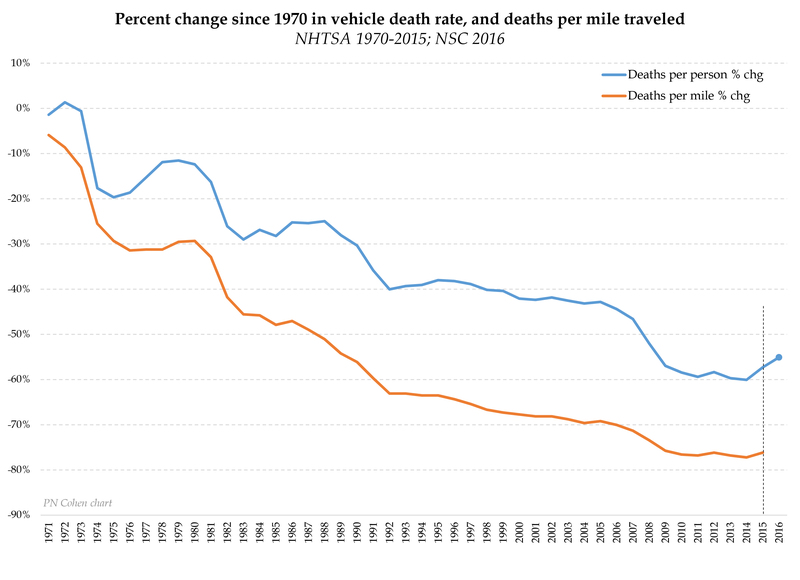 That is a troubling spike, which takes us all the way back to 2009 fatality rates. We should make the roads safer, by using them less and using them more safely. But come on, NYTimes. Read the whole, completely aggravating series, under the texting tag. The media has been using the same techniques to over-hype the recent increase in the homicide rate, https://andrewpwheeler.wordpress.com/2017/02/09/much-ado-about-nothing-overinterpreting-volatility-in-homicide-rates/. Year-over-year percent change is a very poor metric for basically everything — and using a lag of two years to make everything seem as dramatic as possible is a new one to me. Technology in today’s world, what with cell phones and texting and driving is not a good combination… That’s why it should be banned… The law needs to get really strict on drivers around the world. Maybe the “law getting strict” is part of the reason for the increase in deaths? Anecdotally, people don’t stop texting while driving, they just do so in even more distracting ways by hiding the phone farther from prying eyes (down by their legs, etc). There is always the Bluetooth device in the cars now a days’?? It is imperative that news reporters report accurately–and when they don’t, their messages can be undermined. To my knowledge, my adopted state of Florida has the most lax distracted-driving laws in the United States. The only law regulating cellphone usage at all, in this state, is against texting while driving–but only as a secondary offense. This means a cop has to pull you over for a primary offense–like not wearing your seat belt–before he or she can even give you a ticket for texting while driving, in the state of Florida. The politicians in Tallahassee refuse to move texting while driving from the position of a secondary offense to that of a primary offense because everything they do panders to the tourists who consider this whole state their personal Disney World. It’s all about money, of course–as it always is, for politicians. Though I have no statistics to back this up (the state of Florida doesn’t release statistics on even the most egregious cellphone usage while driving, to the public, since it’s not illegal), I know the death toll is rising. I can see it on the road every day–and I can hear it from my house every day (more and more ambulance sirens). Most of my fellow Floridians don’t even know this state is so lawless regarding cellphone usage while driving. And when I mention it to them, they usually say the police can’t enforce the laws against it, because it’s so pervasive. Then I have to explain that the police can’t enforce the laws, because the politicians in Tallahassee (both Democratic and Republican) refuse to pass any laws. Cops can’t enforce laws that don’t exist.